We gathered in Leah’s living room on Wednesday to take the wine industry to task for their pandering and patronizing. While we certainly anticipated that the bottles with animals might not always be the tastiest on the shelves — as the buying patterns of certain uninformed members of our demographic might unfortunately suggest to the industry marketers — we were not prepared for the unpleasant task of discovering the very pronounced inverse relationship that seems to exist between the presence of an animal on the bottle and the quality of the wine contained therein. Jason and Emily opened things up with the 2000 Iron Horse “Russian Cuvee” (Green Valley), allegedly the wine that the Reagans served to Gorbachev at the historic summit meetings until he was drunk enough to agree to Perestroika. Nice big nose of oak and toast; Jordan got honey, and Brian got butterscotch. The palette was broad with acid and oak notes, and Jason picked up some sweetness. Leah and Katie thought this sparkling wine wasn’t quite sparkling enough, accusing it of running a little flat, but it was well-received by the rest of the room. Next up was Jason and Emily’s other bottle, an Italian number featuring a veritable menagerie on the label. 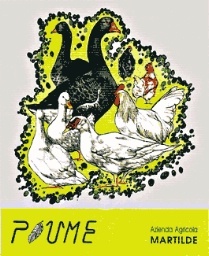 The 2004 Azienda Agricola Martilde “Piume” Malvasia (Oltrepò Pavese, Lombardy) bore no fewer than eight barnyard fowl on the front, as well as numerous confusing Italian words on the back. The nose, unfortunately, was equally confusing. I immediately got some interesting pine needle or juniper berry notes, but these were overrun with acetone and Deep Woods Off. Jordan got Windex, and others got Pine-Sol. Andrew and Myla offered pomegranate, giving us some hope for the palette, but it turned out to be harsh and acidic, almost undrinkable. Jason confessed that he’d gotten it on the discount rack, so who knows what the bottle had been through. Favorable tasting notes exist elsewhere on the internet; maybe we just got a bad one. Our second equestrian foray of the night came in the form of the 2005 Wild Horse Chardonnay (Central Coast), which offered a big toasty oak nose, as well as some sesame, according to Brian. The palette showed more toasty oak; others got lemon, and newbie Courtney picked up caramel. Leah thought it tasted like “a vanilla birthday cake, like boxed sheet cake.” Newbie Bradley thought the oak was too heavy; Jason agreed, saying he’d had better wine of this style at this price ($16). At least it was inoffensive, fast becoming a gold standard on the evening. The 2006 Bogle Vineyards Chardonnay (California) was another disappointment. Oak and almond extract up front; I got some interesting bacon on the nose, while Jason got citrus. Then I turned up some asparagus, and Jordan suggested specifically white asparagus, but Andrew dismissed “white asparagus” as a myth. The palette was uninspiring; Jordan alleged that it tasted like chlorinated pool water. Andrew replied, “that’s just because it doesn’t have as much oak as the last one on it,” but Jordan shot back, “no, that’s because it has nothing on it.” Agreement unfortunately abounded. Hopes were high for our first red, the 2005 Four Vines “Loco” Tempranillo (Paso Robles). The nose delighted us with notes of cherry, smoke, and spice; Brian got cloves, and Leah added “wheat bread.” Newbie Michael offered “corned beef on rye,” while I offered the less interesting violet. Moving on to the palette, though, we were attacked with some harsh acidity. “It’s so bad! Oh my god,” lamented Jordan. Katie, who’d bought the wine after enjoying it at a tasting, said this wasn’t the same palette she’d experienced the first time. Like a self-fulfilling prophecy, the wine had gone loco on us. Next up was the amusingly-named 2006 Holus-Bolus Syrah (Santa Ynez). Leah enjoyed the “maple and brown sugar” on the nose, and Jordan threw in cinnamon. Several people picked up barbecue sauce; I alleged that it was pure Worcestershire sauce, but I was shouted down, with newbie Mary providing me a sole voice of concurrence. Myla got root beer hard candies, while Bradley and Brian got blackberry. On the palette, some of these flavors persisted, but some serious black pepper notes reared their heads and kind of drowned everything else out. 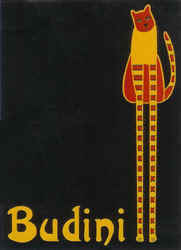 Andrew offered us the 2006 Budini Malbec (Mendoza), adorned with a picture of a stilt-legged cat. Huge cigar smoke on the nose, along with cherry cordial and black pepper. Upon the first sip, Brian exclaimed, “it tastes like styrofoam peanuts,” prompting Jason to remark, “someone had an inquisitive childhood.” Fortunately, there was more to be found than just styrofoam; I got rich cherry and cedar notes, and the whole room agreed that for $9, this was a solid bargain. After cheese, we returned to the wine with the 2006 Hahn Estates Meritage (Central Coast). A gamey nose, featuring notes of cinnamon according to Jason and Katie, yielded to an overly alcoholic, light-bodied palette. Bright cherry was perceptible, but structural flaws rendered this one a loser. Maybe a year or two in the bottle would help it find itself; maybe not. We moved on to the 2004 Kenwood “Jack London” Merlot (Sonoma Valley). Candied plums on the nose provided us with some intrigue; Jason added “forest fire.” The palette, again, offered a lighter body than the nose had led us to hope for. Decent fruit flavors were somewhat drowned out by a hot character (14.5% alcohol really showed itself). Not a bad wine, but definitely could’ve used more body. …like putting a down-payment on a bottle of 2006 Owen Roe “Sharecroppers” Cabernet Sauvignon (Columbia Valley), the first still wine of the evening that everyone really enjoyed. A blackcurrant nose also boasted some nice raisin notes, and coaxed us into — finally — a nice, full, well-textured body. Good balance, decent fruit, and “a tiny hint of sweetness in the finish,” offered Andrew, “which I enjoy.” I’d snagged this one for $22 at Vendome; not at all a bad bottle to have on hand. Always nice to find a reasonably-priced Washington Cab with these solid attributes. We finished things up with a very bizarre bottle indeed. 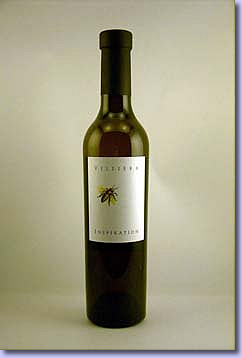 During that same Vendome trip, Jordan had found a long-neglected bottle of 2000 Villiera “Inspiration” (South Africa), a dessert wine with a bee on the label. No indication of the varietal, although we’ve since learned it was Botrytis-affected Chenin Blanc. The bottle was dusty and the price-tag was dry and peeling, but if any wine can stand abuse, it’s dessert wine, right? We poured glasses, and the wine came out rusty red, like a puddle in clay soil. Undaunted, we ventured into the nose, which was resplendent with honey and even a graham cracker character, not unlike a light Sherry. The palette, as we’d hoped, was fine, offering apricot and orange marmalade. Delicate and lovely, this was a great find for $20. The late successes notwithstanding, “Bottles with animals on the label” was a difficult tasting and a worthy cautionary tale. Please, people… do not be charmed by the fauna. As is typically the case with wine, it’s the flora — and the fruit borne therefrom — that really matters. Stop saying “pal” – I know you’re just doing it to piss me off now. I was so angry at this meeting, I took very few notes… I don’t think your pompous cat was gonna make the cut. I’ve been waiting for these tasting notes so that I could pick up a bottle of the pompous cat Malbec! I had fun with the winos, have another Wednesday meeting and I’ll be there!